It’s referred to as “America’s Resort.” They’ve been serving guests at the 11,000-acre campus in White Sulphur Springs, West Virginia since George Washington commanded the colonial armies. For 240 years the natural mineral springs and beautiful views have drawn the world’s most celebrated guests, including 27 US Presidents. This renowned property offers 710 rooms, 33 suites, 10 lobbies, and 40 meeting rooms. The Greenbrier is a National Historic Landmark and a world-class resort. 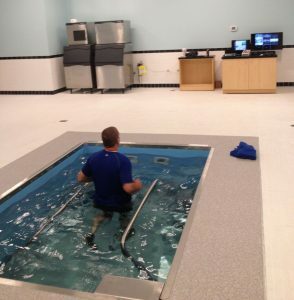 In 2014 the resort purchased a HydroWorx 1200 Series pool. This aquatic addition serves as the state-of-the-art centerpiece in the new Greenbrier Sports Performance Center, designed to attract football teams for spring training. Since its inception, the Center has hosted the New Orleans Saints and the Houston Texans, both with multi-year contracts. 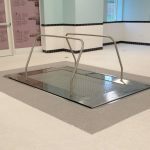 The HydroWorx 1200 was chosen by the Greenbrier staff for its fully adjustable treadmill floor, providing access without ladders or steps. 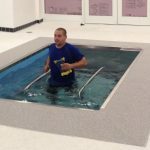 The treadmill floor increases from 0 to 8.5 mph in 0.2 mph increments on a treadmill surface that is cushioned with a low-impact design and excellent traction for conditioning or rehabilitation. The Greenbrier is showing its athletic venue prowess in other ways, too. Under the direction of Jim Justice—Greenbrier owner, West Virginia Governor, and high school basketball coach—they’ve added not only a sports performance center, but also a tennis stadium and in 2011 their 104 year-old Old White TPC became a stop on the PGA Tour. What would George Washington think of underwater treadmills and the NFL? Tough to say. He’d probably delight in the creativity and ingenuity fostered by freedom. In any case, we’re proud to be part of the storied Greenbrier. Let the tradition of elegance and innovation live on!